TORONTO — Daniel DiManno sold his Toronto house for less than he had hoped and wanted to see if prices would cool before he bought a new one. But Canadian mortgage rates are rising again and that’s spurring DiManno and others to jump back into the market, cutting short an already brief housing downturn. “I saw that they are going to increase rates, so I called my bank last Friday and locked in 2.5% for 120 days,” said the 31-year-old accountant, starting the clock on a four-month search for a new home before borrowing gets more expensive. After nearly a year of cooling sales and plenty of concern that Canada could head for a U.S.-style housing crash, demand has roared back in key markets. What’s still unclear, however, is whether the recent surge is a reinflation of a real estate bubble, a final rush of buyers before rising rates choke off demand, or just a sign of market resilience. 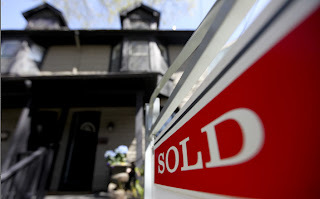 The rise in mortgage rates comes after North American bond yields jumped on fears that an improving U.S. economy will cause the Federal Reserve wind down its monetary stimulus program, known as quantitative easing, more quickly than expected. After a long cold spring that dampened house hunting, May sales of existing homes rose 3.6%, the biggest monthly gain in almost 2-1/2 years, returning the market almost to where it was before Canada’s Conservative government tightened lending rules in mid-2012 to stave off a housing bubble.